Frieda and Aaron Braithwaite and their daughters, Bella and Ariel, have enjoyed a week’s family vacation in Jamaica to celebrate Bella’s sixteenth birthday and are set to fly home when Aaron and Ariel are killed in an automobile accident. The first year without them is difficult for the surviving Braithwaites, but they are slowly moving forward with their lives when the first anniversary of the tragedy causes a reversal in Bella’s recovery. She becomes sullen and withdrawn, and her mother fears losing another daughter. 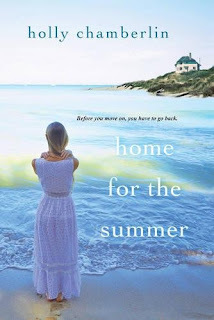 At the suggestion of her mother, Ruby Hitchins, Freida and Bella leave their home in Massachusetts and retreat to Ruby’s nineteenth-century farmhouse in Yorktide, Maine, for the summer. Ruby hopes that some family bonding and tough love will push Bella back into ordinary life. As mother and daughter continue to move through the stages of grief, they find solace in familial ties with Ruby; with George Hastings, who is waiting for Ruby to respond to his proposal; and with Paul Morse, an old friend who is as close as family to the three generations of women. Freida reconnects with Jack Tennant, a childhood friend, and with her father, who abandoned his family when Freida was eleven. Bella’s life intersects with that of Clara Crawford, a troubled young woman spiraling downward into depression and self-destruction. These relationships too, in very different ways, help Freida and Bella let go of their survivor’s guilt and look forward to the future. The summary above makes this novel sound much simpler than it is. It is a dense story than runs for ninety chapters plus a prologue and epilogue. It is heavily introspective, and the plot is convoluted, weaving in the losses and abandonments that litter the lives of all the characters. Chamberlin does an excellent job of capturing the grief process, often with real poignancy. Anyone who has lost a loved one will recognize the devastation that small moments can cause, moments such as morning coffee that is no longer shared. I was interested in Ruby, Freida, and Bella and their relationships with one another, and I wanted Ruby and George and Freida and Jack to find happiness together. But I grew weary of the sheer volume of the book. Some of my favorite books are quiet, introspective stories, but I thought this one was too much. Despite some clear strengths, overall this book just did not work for me. Thanks for your review PJ. I can understand the length of the book being a problem. It is the unusual book that I can stick with that long, no matter how good it is. We all live busy lives and it is hard to carve out time to read. I plead guilty to looking for shorter books to read because I know I will be able to enjoy and finish them. If I do have a longer book I want to read, I work on finding a time I can set aside. Thank you for the review.